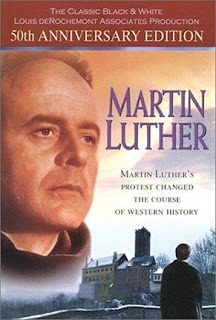 What sort of film is Martin Luther? The sort that gets produced by a church, and yet gets nominated for an Oscar – solid theology and high production values paired together. How often has that ever happened? It does get off to a slow start; the first couple of minutes are more documentary than drama. But when we get introduced to Niall MacGinnis as Luther, his brilliant portrayal sweeps us into the story. We follow along, starting with his tormented time in the monastery, and continue all the way through to his marriage to an ex-nun. MacGinnis captures all the contradictions of the man – even as the Reformer stands before the Diet of Worms strong and defiant he is distraught and trembling. That's is certainly among the best Christian films ever made. Though there is nothing in the film that is graphic, some scenes are psychologically intense. On the one hand, I think that would just go over the heads of most children, but for some young sensitive sorts, Luther's emotional turmoil might be too much. This is a black and white film, which is a mark against it in many minds. But if you're considering showing this to your class or to your family, here's the secret to helping them get into it: make the sound your priority! In a dialogue-driven film it's the sound, much more than the visuals, that really matters. I still remember watching this with my Grade 6 class, years ago. The screen was small - minuscule by today's standards - but this big box TV had great speakers. There was no fuzziness, no straining to understand what was being said - we could all follow it. And after 30 minutes or so, we were all hooked. 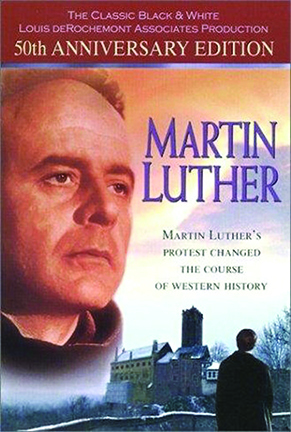 There is also a 1974 Luther that is again marred by an instance or two of God's name being taken in vain (why do Christian films do that?) and which portrays Luther's action as being motivated more by arrogance than devotion. So, again, the 1953 version is superior. This would make a great film for a dad and mom to share with the family this Reformation Day. I've seen kids as young as 7 enjoy it, though with younger children you're going to want to break it into a few "chunks" so it spread out over two or three nights. But for those 12 an up, so long as they are "forced" to give it a half hour ("No, you can't check your smartphone while watching this") it will grab them. You can pick up a copy at Amazon.com by clicking here.